Our Denim Washed by The Stones from Mt.Fuji. This is a time to oneself, free from the sway of popular trends. Not fast, but slow. Not changing things up, but keeping them as they are. Other people don’t get to decide what’s cool. You want to be honest with yourself and live to your own set of values. You like something casual that meets you as you are, without overreaching. It is this fondness that makes you extra particular about the finer details. This sense of extravagance gives life to your own style of clothing. Much like Mt. Fuji has a presence even if it isn’t located immediately in the city center. Remembering the feel of the sand underneath my feet as I walk barefoot along the beach with my pet dog. The rough feel of the ground I once played on without my shoes on as a child… That feel is “scoria,” a pumice from Mt. Fuji. “Could we use this stone to create something that feels like we are near Mt. Fuji?” Looking down at my feet, I find this sensation in the jeans I have long since become accustomed to. This MADE IN JAPAN DENIM is stone washed using scoria from Mt. Fuji. After my requests to make such a trial product were turned down by apparel agents I found myself at a loss for what to do. It was then that I met with Mr. Takuto Mochizuki, representative of “Atelier Kizuna,” a jeans repair and customization workshop at the foot of Mt. Fuji. Mr. Mochizuki was open to my ideas and agreed to manage the project from the design stage through to the sewing and stone wash processes. 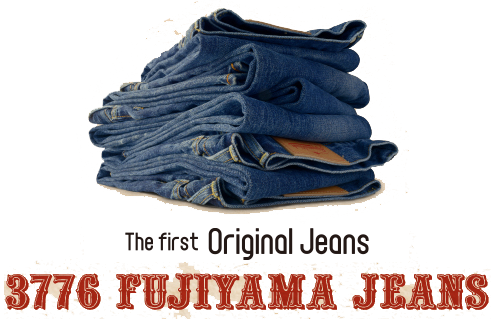 What we ended up with was “Fujiyama Wash Jeans,” a pair of jeans dyed a strong shade of navy blue, much like Mt. Fuji itself standing tall in fine weather. 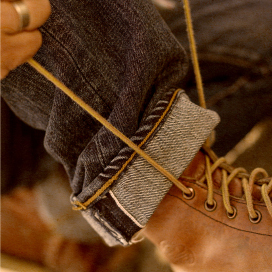 Takuto Mochizuki taught himself how to use sewing machines and got his start by focusing mainly on denim repair. His skills soon caught the attention of a designer at the Canadian denim brand 1921, and he was hired on at the brand as a designer. He went on to achieve high acclaim at famous specialty boutiques around the world. 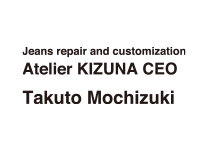 Following this he began to question the benefits of mass production, and decided to establish his own studio “Atelier Kizuna” out of a desire to start something that only he could achieve. With his studio at the foot of Mt. Fuji, he continues to produce his works while surrounded by nature. He is kept in a whirl of business, with repair and customization orders coming in from not just denim enthusiasts from within Japan, but even from musicians, soccer players and other overseas customers as well. Born in Susono City, Shizuoka Prefecture. After graduating from an art school in Tokyo in 1984, he established a career working as a designer at an advertising agency, and then a director at a design office. He established native graphic Corporation in 1999 in Shizuoka City, Shizuoka Prefecture. There he is engaged in creative works relating to graphic design and website design. On his days off, he loves joining his friends for some fishing along the fields at the foot of Mt. Fuji where he once played as a child. He enjoys the local lifestyle to the fullest with his friends, family and pet dog.